People have used traps for as long as humans have hunted. Traps predate all forms of weaponry, except possibly rocks or a club. There’s no surprise then that there are literally scores of trap types and hundreds of specific traps that range from primitive types such as a hole in the ground to sophisticated metal alloy traps. Selection of the right kind of trap for a specific target species is important, but that selection must fit the conditions of a survival emergency. For example, unless you can stock a bug out location with commercial traps, their bulk and weight may be prohibitive for a bugout bag. In a survival situation, people often have to rely on some very simple and lightweight trap components such as piano wire or parachute cord and create most traps from natural materials found in the environment. Among some survivalists, the ethic of ‘build it yourself’ and ‘use natural material’ is very strong. When it comes to traps, it’s not only satisfying to build your own traps, but it also means you’re in charge of repairing and replacing them – you’re not dependent on a distant and potentially unavailable manufacturer. On the other hand, building and maintaining traps is a time consuming activity, time that may not be readily available in a survival situation. These days some commercial traps can be reliable, effective and surprisingly lightweight. Having a couple in a bugout arsenal might be a good compromise. In general, commercial traps last longer than hand-made varieties, but even metal traps are not immune to the teeth or strength of a panicked animal. Unless a trap kills immediately, most animals become desperate and wild. They will attack the trap and finally their own limbs in an effort to find release. Commercial or homemade, consider trap repair and replacement an ongoing task. Leg-hold traps are almost all metal devices, most of them spring loaded. As the name suggests, they catch the animal by a limb and hold them until they die or are collected. These are probably the most familiar of commercial traps, often pictured in movies of beaver or other fur-bearing animal trapping. Most leghold traps are too bulky and heavy for bugout survival. Body grip traps, also known as Conibear traps (named after their inventor Frank Conibear), are constructed with two rectangular spring-loaded frames that snap together to fatally crush vertebrae or skull. This is mainly a commercial trap but possibly light and small enough to consider for bugout equipment. Snare traps rely on loops of wire or cord that slip like a noose and tighten when an animal is caught. These are among the oldest, simplest and least humane of traps. Because they don’t require equipment, they’re an obvious type for survival situations. Pit traps use holes or pits big enough for the target animal to fall into but not escape. They often include means of impaling or otherwise disabling the animal. Pit traps are relatively simple but usually require a shovel or similar digging tool, which may make them less applicable for a survival situation. Cage traps are a relatively modern innovation from the 1920s that lure animals into the cage with bait and then have a triggering mechanism to close a gate. Unless stored at a fixed base (cabin, tent), cage traps are too bulky and heavy for bugout situations. Deadfall traps like snare traps are among the oldest of traps and are seemingly simple – something heavy like a rock or log falls on the animal and kills it. However, the triggering mechanisms for a deadfall are not easy to construct, as achieving an effective response time (from the point where the animal hits the trigger to where the deadfall strikes them) requires skill and considerable experimentation. Fish traps cover a wide range of traps, from drop lines with multiple hooks, to net configurations and “basket traps” where commercial or handmade baskets funnel fish into an inescapable confinement. With available netting, line or hooks constructing fish traps is relatively simple and can be very effective. Weaving a basket trap is a challenge but also very effective. As mentioned, there are innumerable variations for each of these trap types, usually including modifications for water or ground trapping and for specific species. Each type of trap has requirements for setup, including securing it to the location. Free standing traps, such as a Conibear or leghold trap, need to be chained and staked to the ground, otherwise a trapped animal could drag them far from the site. It is possible to take an animal with a naked trap, unconcealed, unbaited and in the open, but common sense would tell you that it’s unlikely. Most animals are wary. They constantly scan their environment, looking for motion or anything that seems out of place. No surprise then, a part of successful trapping is using camouflage and deception – tricks to conceal the trap and guide animals as they approach. Another part is overcoming wariness with lures – bait. Obviously different animals respond to different bait with major distinctions between birds, predators (of all kinds), herbivores and fish. (Bacon comes close to being the universal bait.) From the survival perspective, bait is not likely to be part of the bug out pack. Mostly it will be food pieces gathered locally, for example, seeds and berries for plant eaters (birds, rabbits) and pieces of meat for predators. As with so much of trapping, using bait effectively is partly a matter of good observation (what are the animals eating locally) and experimentation (gaining experience). Combining the siting, placement, camouflage and baiting of a trap into a presentation that’s most likely to catch the target animal is called creating a set. The idea behind a set for a trap is to place the trap in the best orientation and make the area around the trap look as natural as possible. This is much like the “set” for movies or theater, where people decorate a location to represent some environment. In trapping, creating an appropriate set is an important topic, right up there with site selection. In fact, they go together. By observation of animals, in particular the ones to be trapped, you try to learn where they eat, move about and nest – this determines the site. The set determines the way the trap should look to the target animal. For example, to trap animals such as fox, coyote, raccoon and opossum one approach is a dirt-hole set. In this case, the dirt-hole is just that, a hole in the ground that is made to look like the entrance to a den or nest. Predators such as fox are accustomed to checking holes in the ground for prey, so one part of the set is to create the appearance of an active ‘hole,’ possibly using bits of bait inside the hole. The other part is to make a set that entices the target into the trap. For example, using sticks to bar access to the hole except from one angle, where the trap lies. There’s a lot of trapping lore about preparing a set. It’s almost a form of art for some people, although you can overdo its importance. Given plentiful animals, a good trap and the right bait, the set doesn’t need to be very sophisticated. On the other hand, where there are fewer animals, often for larger animals and predators, a near perfect set may be a requirement to have any success. The human sense of smell is so poor that we hardly even notice our own body odor. Not so with most animals; the human smell is not only strong but distinct and unusual. Wild animals will shy away from anything with human odor, whether they’ve encountered it before or not. That means part of successful trapping is making sure that you don’t leave a human trace around your traps, or at least mask it. In practice, this at least means using gloves to handle the trap and prepare the set, along with at least some fastidiousness about keeping the site clean (don’t drop candy wrappers at the site). Experienced trappers often go so far as to boil there traps or smoke them in campfires to remove or mask the human trace. 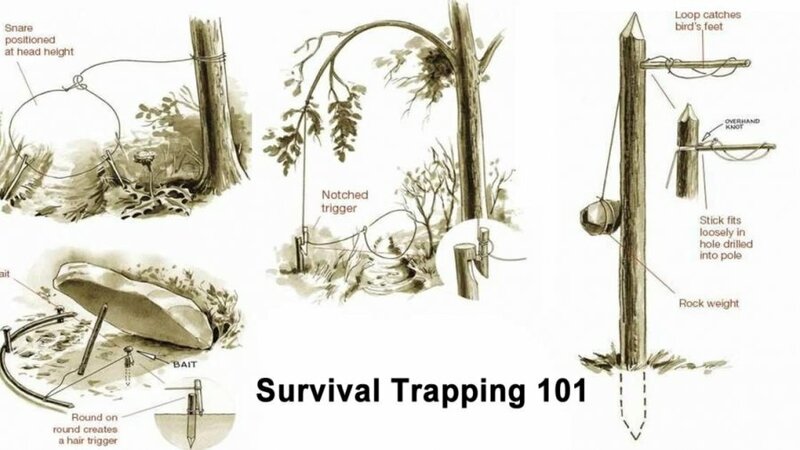 One final topic for survival trapping – establishing one or more trap lines. As the name suggests, a trap line is a sequence of traps that you visit on a regular basis, usually once a day. Typically, a trap line uses paths or natural topography to move smoothly from one trap to another and then back to the starting point. The idea is to make walking the trap line efficient, taking say not more than an hour a day to complete. There’s no requirement as to the species to trap, only that the traps are sequenced in a way that you don’t miss any as you walk the trap line. If you have a lot of traps, it may make sense to have more than one trap line. It’s a crisp fall day with a dusting of snow on the ground and the temperature just below freezing. Not exactly the friendliest weather for surviving in the wild, but it has advantages. Animals are still active, they haven’t gone to ground for the winter and some are still out harvesting food. I’m looking for rabbit or actually the local version of a hare (black-tailed jackrabbit), which is bigger than the average cottontail and have more meat. They’re not plentiful around here, but if you know where to look, there are places with multiple pairs and their offspring. I’ve done my homework on these hares. They like the transition zones between forest and meadow where there’s a mixture of plant life, especially young trees, berries and succulent greens. I’ve seen their runs and the entrances to several burrows. The burrows are hidden, usually in bushes, which can make them difficult to place a trap, but the runs cross the open meadow in a few places and I’ve spotted one that looks like more than one hare family uses it. The fresh tracks in the light snow confirm that possibility. Since I’m trying to catch moving hares, I’m using snares without bait. The strategy is to locate the snares along the run, several feet apart to make it possible to catch more than one hare. These hares are pretty big, about six pounds or so. They’re also strong, so whatever the trap, it needs to be anchored securely. In the case of the snares, I’m using lengths of wire cable (2 mm) pre-cut and shaped into loops big enough for a good sized hare leg and with aluminum ferrules and stops to control the loop slip. These aren’t subtle, but they’ll hold a panicky hare. In this case, because there are plenty of small aspen around, about 2-5 inches thick, I’m going for a bent sapling engine that will spring the noose and snap the hare away from the trail. It’s a workable strategy for trapping more than one hare along the same run. The key piece of any snare and the trickiest part to set is, of course, the trigger. I use a pole barn nail, about 10”in length, for the trigger stake. A cable attaches to the bent sapling and at the other end a loop in the cable hooks into the head of the nail. There’s a short tail of cable on the snare itself with a loop on the end. The trigger cable goes through that loop before hooking on the nail. The snare in most cases is set as an open loop just above and at angles to the run so that a moving hare is most likely to catch the snare with a foot. I try to get the triggers quite sensitive so that the slightest tug on the snare tail will pull the trigger loop off the nail head – whoosh, up goes the sapling – hopefully with the hare caught by the leg. I usually try to disguise the snare itself. The best is to have enough grass bordering the run so that the greenery masks the snare cable. Hares ambling down the path typically use short hops with their feet projecting ahead of the leg. I try to get the back of the snare elevated at just the right height to allow a foot to get under it, so that when the hare lifts the foot for the next hop it pulls the trigger. On this particular run, which is close to fifty feet long, I manage to get four traps set in reasonably good positions. There’s not a lot of site or set prep, but the triggers are finicky, especially when under tension from a stout sapling. I usually manage to trigger a few myself, and have to be careful not to get clipped by the snare cable as it whips into the air. I’ve always had a healthy respect for the snap of a trap, going way back to mousetraps and sore fingers when I was kid. There are no guarantees in trapping, but if I’ve done my set right, I hope to get a couple of these hares for dinner.